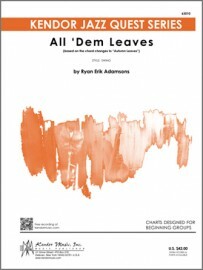 Description: We welcome Ryan Erik Adamsons to the Kendor family of writers with this swing original based on the chord changes to Autumn Leaves. Written for beginning groups, the solo section is written out with solo sheets provided in all keys along with scales to assist students in improvisation. Featuring Kendor Konvertible scoring for 9-17 players and includes optional parts for flute, clarinet, horn in F, tuba and vibes, along with a guitar chord chart by Jim Greeson. The brass ranges are very accessible, with trumpet up to F5 and Db4 for trombone. Rhythm section parts provide the drummer with a great concept of what to play, and notated piano voicings and bass lines are provided. Duration 3:05.